Holland America has a long-standing Culinary Council drawn from leading chefs worldwide, who advise on the food served on the ships. On Gala Nights, a number of their dishes might be showcased. Their choices inform the quality of cuisine onboard, but as with every large ship, there will always be limitations on what you can achieve in terms of quality when you are feeding large numbers of people. Food on this ship is generally of a high standard in all the outlets, free or fee. 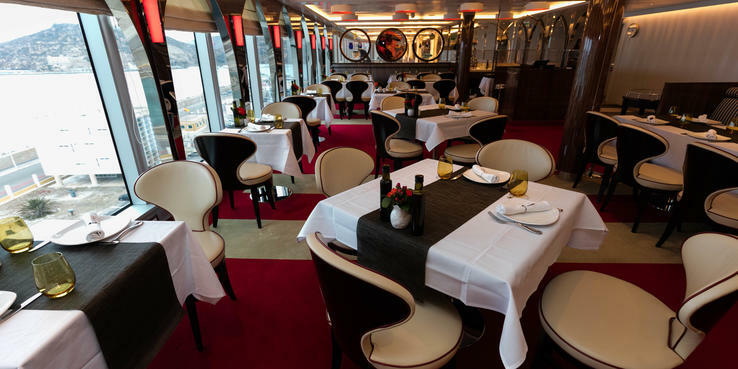 The Dining Room (Decks 2 and 3): This is a beautifully designed, double-deck room with a stunning wine tower as the centerpiece, a sweeping staircase, floor-to-ceiling windows looking out the back of the ship and a vast, two-deck-high sculpture that resembles the rib cage of a whale. There is a wide selection of different table sizes from two to eight. The chairs are leather, in a stylish soft taupe color. Ceilings are studded with strings of red and white lighting, which coil and interlace high above diners. It's designed to wow, and it does. The food, though of a high standard, lacks a certain refinement and lightness, which is often the case in large dining rooms. There's plenty of choice, and all the numerous food intolerances are catered for, but it doesn't zing, like it does in the specialty restaurants onboard. There are a number of different menu variations, which HAL changes out on a regular basis. On the cruise we were on appetizers might include: Caesar salad, antipasti, a selection of soups, including some nods to the line's Dutch heritage such as Dutch pea soup. The French onion soup had a rich, deep flavor; the Caesar consisted of a handful of leaves and a few Parmesan shavings ("stingy" was the word used to describe it). The devilled eggs had a bit of a kick, and the antipasti delivered, but in a somewhat underwhelming way. There is a good selection of entrees -- seven in total, which will include a fish, steak and even game birds. Three HAL Signature dishes are always on the menu: New York strip loin, grilled salmon and broiled chicken. Our party tried a selection: "angry striped bass" with garlicky clams and mussels promised much but was a little bland, despite the interesting ingredients; the veal cordon bleu was slightly stodgy. However, the grilled salmon was exceptionally tasty, if just slightly on the dry side. Other menu items include: seared tuna, oysters Rockefeller, seafood chowder and chicken noodle soup to start; prime rib, chicken breast and Asian vegetable noodles as entrees. On certain sailings (such as our one), the chef will go to a local market to source produce -- we enjoyed Norwegian salmon, caught that morning. The desserts are plentiful and delicious, and might include chocolate avalanche cake, cherry pavlova and treacle sponge pudding as well as cheese and fruit and ice cream, followed by coffee. Service is attentive and efficient. The wine sommelier is particularly helpful and knowledgeable. Each dish has a symbol indicating whether it is vegetarian, responsibly sourced or a creation of the Culinary Council. Tell the waiter if you have dietary requirements or intolerances. The main dining room is open for breakfast (8 a.m. to 9:30 a.m.), lunch (11:30 a.m. to 1 p.m.) and dinner (5:15 p.m. to 9:30 p.m.). Grand Dutch Cafe (Deck 3): The food is free here; the specialty coffees and the Heineken beer on tap are not, nor are some of the sweet Dutch treats. This cafe specializes in Dutch dishes, which might sound (and possibly taste) a little strange to non-Dutch palates. You'll find pickled herring, a type of french fry (friets) in mayo and a veal ragout sandwich, plus plenty of pancake variations. But it's a popular spot all day, with seats looking out toward the atrium and against the windows looking out to sea. Open 7:30 a.m. to 10 p.m.
Lido Market (Deck 9): Koningsdam features a marketplace-style venue, where passengers can select from the buffet or choose made-to-order options, from five themed stations: Breadboard (freshly baked bread, pastries and signature sandwiches); Wild Harvest (salads, fruits and other healthy bites); Homestead (comfort foods such as scrambled eggs and herb-roasted chicken); Distant Lands (dishes from around the world, including those of regions visited by the ship); and Sweet Spot (desserts). The food is very good for a main buffet, and the variety on offer -- from all these regions of the world -- extraordinary. It's a large venue, with lots of seating and plenty of light, with good traffic flow. Often the buffets on cruise ships get awfully crowded at peak times, but we did not notice that here; it was always possible to get a table. The Lido Market segues into the Lido Pool area midship, and to the aft pool deck, so there is always the option of outside seating. Two aspects really impressed us in terms of health and cleanliness. The main one is that no passenger can help themselves to food. The stations are covered in glass, and you always must ask to be served whatever it might be, even a salad or toast. This could lead to potential long lines, but we didn't experience any. The second is the hand-washing stations positioned at each entrance to the Lido Market. Instead of sinks, they are two holes in which you put your hands and they are given a full cycle of soap and water. Open from 7 a.m. to 11:30 p.m. Dive In (Deck 9): Situated just outside the Lido Market, beside the pool, this grill station serves burgers, fries and hot dogs. Open 11:30 a.m. to 8 p.m.
New York Deli & Pizza (Deck 10): Another only-on-Koningsdam venue, New York Deli & Pizza, which overlooks the Lido Pool, is open throughout the day. It serves a selection of cereals, juices, pastries, bagels and coffee and tea at breakfast. At lunch, you can build your own pizza or order from a selection on the menu. It also serves salads and big New York-style sandwiches (e.g. Reuben Rye, Pastrami, New Jersey Club Decker). In the evening you can get a selection of snacks, such as popcorn, nachos and potato chips, for movie nights. Open for breakfast (6:30 a.m. to 10:30 a.m.), lunch and dinner (11:30 p.m. to 8:30 p.m.) and for snacks in the evening (9 p.m. to 1 a.m.). Explorations Cafe (Deck 12): Situated in a great spot high atop the ship, within the Crow's Nest lounge, Explorations Cafe has free food such as sandwiches and pastries, but charges for coffee and tea. It's a lovely spot to grab a drink and a bite to eat and take in the view, or read the newspapers and browse online. Room Service: 24/7 in-cabin dining is complimentary with a few exceptions. The following items from specialty restaurants have a delivery charge: Tamarind Bento Boxes, $9.95 per item; Dive In Burgers, $4.95 per item; and Pinnacle Grill, $15 for steak and $20 for lobster. Koningsdam features a number of new-to-the-line dining venues, while maintaining fleetwide favorites such as the Pinnacle Grill and Canaletto. The Culinary Arts Center, a showroom for food demos on most Holland America ships, has become a dining venue on this one. The majority of the specialty restaurants are on Deck 2, clustered together on the way to the main dining room. The exception is Tamarind, which has a stunning spot overlooking the sea right at the back of the ship, and Canaletto, which is an adjunct to the Lido Market on Deck 9. Overall, the quality of the fee dining is very high, and in some cases outstanding. The restaurants are an extremely good value, considering the quality of the cuisine, compared to the prices being charged on many other lines. Also, HAL has resisted going down the route many other cruise lines are going by making specialty restaurants on Koningsdam a la carte -- all bar one charge a flat cover. Reservations are always recommended in the specialty restaurants, but especially in the smaller ones such as Sel de Mer. There are in addition various Dining Packages on offer, which give good savings. These start at $44 and include dinner at Pinnacle Grill and Canaletto; for $65 you also get to eat at Tamarind; and for $119 you can try out all the specialty restaurants. Sel de Mer (Deck 2); a la carte pricing: Translating to "salt of the sea," this for-fee restaurant serves up French seafood in a traditional brasserie setting, in which fresh fish and shellfish are brought to your table so you can choose. Chefs also will bring back locally caught fish from port and feature them as specials. The whole French brasserie feel starts with a blackboard outside with the catch of the day chalked on; inside, one wall is made up of a single impressionist painting and ceramics line the walls. A trolley in the center of the room showcases the catch of the day and menus come as you'd expect in France: a single sheet listing the appetizers, entrees and the specials; while on the other side of the page you have a wine list featuring French wines. The venue is not trying to replicate some mom-and-pop brasserie in a sleepy French fishing town -- it's got more of an air of Parisian chic. And Sel de Mer is not cheap. Appetizers, which might include crab salad, crudo of fresh fish (like a ceviche or sashimi dish) and baked escargots, start at $6 for the whitebait and rise to $14 for the pan-seared foie gras. We opted for the beef Pot-au-feu, which is a beef soup, piping hot, rich and tasty, and served on a wooden board in a metal pot. Or you can just dive in and share a traditional fruits de mer for $49, which includes lobster, oysters, crab, etc. Entrees are mainly seafood with a selection including salt-crust baked branzino ($26), bouillabaisse Marseillaise ($19), moules frites ($16) or a seafood platter ($24). There's even a Maine lobster ($32). The market catch is served how you like it, and presented to you at the table ahead of cooking. We checked: The chef had gone out that morning to choose from the local market -- which is rare on a ship this size. And when it arrived, there was no doubt that it had been swimming in the Mediterranean a few hours earlier -- not frozen and shipped in from Chile. Desserts include apple tarte tatin, profiteroles or a chocolate pot. There are also coffees and petits fours. The whole meal with wine would set you back somewhere north of $100, so this is not a cheap option. Open for dinner: 5 p.m. to 11 p.m.
Dinner at the Culinary Arts Center (Deck 2); $20/$39 (including unlimited wine): Holland America Line's show kitchen transforms into a dining venue at night for the first time on Koningsdam. The room is large and well lit with an open kitchen as its centerpiece, and a combination of tables for two and large tables for groups. You're invited to get up and talk to your fellow diners, which makes for a convivial atmosphere. It's a farm-to-table concept, with the emphasis on vegetarian and organic dishes, prepared simply, though portion sizes might be a tad too small for some. The line has a partnership with herb specialist Koppert Cress, and grows cress in fridge-like incubators onboard the ship; it appears in most dishes. The menu has just five dishes (changed every seven days), two appetizers which are both served, and a choice of three mains -- a fish, a meat or a veggie option -- plus a single dessert and a cheese plate. The paucity of choice might put some people off; however, the unlimited wine option might appeal. The meal is a bit of a show, beginning with an intro from the head chef, who then talks you through the concept and each dish. It's an open kitchen, and semi-interactive in that you are invited to come up and watch the chefs prepare, create and plate, though you can't actually participate in the cooking. Our menu consisted of an amuse-bouche sorbet, followed by a small salad and then a celery and kale risotto, which was a bit gloopy for our tastes. The mains consisted of rib-eye steak, sea bass or a quinoa-based dish. The steak was delicious, perfectly cooked, and melted in your mouth. A choice of cheese or desserts, plus various teas and petits fours served lollipop-style on sticks, rounded off the meal. For the fee, it's good value, especially if you opt for the unlimited wine option (two excellent choices from the Snoqualmie Winery). The Culinary Arts Center serves dinner at just one 7 p.m. seating. Pinnacle Grill (Deck 2); $35: A mainstay of Holland America's fleet, this restaurant is all about perfectly cooked, excellent quality meats -- and, wow, does it deliver. Set in the clutch of specialty restaurants on Deck 2 -- though we think this could be much better situated high up on the ship -- the restaurant resembles a good steakhouse with rich, plush decor and wine bottles lining one wall, floor to ceiling. The meal begins with an amuse-bouche, which in keeping with the style of the place is not a sorbet but an escargot soup, which is an acquired taste. There are nine starters, including classics such as lobster bisque, steak tartare, shrimp cocktail and Caesar salad, as well as some interesting ones such as caviar ($45 supplement) and Dungeness crab cakes. There is a heavy emphasis on meats for the entrees; however, there are two vegetarian options. Steaks are the Pinnacle Grill's specialty, and if you are going to eat steak onboard it ought to be here. There are two choices of filet mignon, a New York strip, rib eye and a 23 oz. porterhouse, if you are feeling peckish. But the star attraction is Holland America President Orlando Ashford's Cut -- a 36 oz. rib eye for a $59 supplement. We divided this up among the table. We opted for the New York strip steak, and it was possibly the best we have eaten on a ship -- rich, tender, succulent -- outstanding. It certainly gave the President's Cut a run for its money. If you don't feel like steak there are other meat dishes: pork chop, lamb chops and an interesting sounding Jidori chicken with "forbidden rice." There is also a wide selection of seafood, including salmon, Alaskan king crab legs, halibut and a seafood mix. You can also opt to pair your steak with a lobster tail for a $20 supplement. There is a good selection of sides, including creamed spinach and shoestring fries with truffle aioli. Desserts include "Not-So-Classic Baked Alaska" (which includes Ben & Jerry's ice cream) and Grand Marnier and raspberry cheesecake, as well as a cheeseboard and a selection of port and dessert wines. A dinner here is a truly indulgent and memorable experience, at a very good price. The Pinnacle Grill also plays host to the occasional pop-up restaurant, most notably Le Cirque and Jonnie Boer's three-Michelin-starred De Librije, which offers a completely different menu at a much steeper price. Le Cirque is $49 per person, and De Librije is $69 per person including wine tasting (four 2 oz. pours). Passengers may also purchase a wine pairing (four 5 oz. pours) for an additional $20 per person. Open for dinner from 5:30 p.m. to 9:30 p.m.
Canaletto (Deck 9); $15: A popular specialty dining venue fleetwide, Canaletto offers an Italian sharing menu at dinnertime for a very reasonable price. Appetizers might include antipasti, risotto or beef carpaccio; pasta dishes include shrimp ravioli and gnocchi. Five large plates are on offer, including braised chicken, veal tenderloin, grilled sea bass and a portabella mushroom (as the vegetarian choice). The food is fine; the problem is the restaurant is situated in the Lido Market, in a glassed-off section, so it feels like an extension of the Lido rather than its own restaurant. Plus, it's right beside the pool area (so people drift by in their swim suits) and opposite one of the doors to the kitchen, so there is constant noise and traffic. Tamarind (Deck 10); $25: For the money, quality of food, setting and decor, this restaurant is our favorite onboard. We truly could have eaten every single item on the menu. The setting is sublime, with the venue set high up on Deck 10 at the back of the ship. (We'd love to see some outside dining space, especially when Koningsdam is based in Fort Lauderdale.) The decor is Asian-themed, dark and stylish, with wooden carvings and sculptures. Food is truly Pan-Asian at Tamarind, with dishes from most of that region including Indonesia, Malaysia, Thailand, China and Vietnam. You're encouraged to pick and mix, and dishes come when they are ready, so it's a relaxed, informal eating experience. Highlights are many and varied, but to just pick a few: satay sampler (with satay styles and sauces from around the region), Shanghai ribs, shrimp tempura, Thai beef salad and crisp fried soft shell crab -- and those are just the starters. There is also a sushi bar with seating, though you can order rolls from your table. Options include a sushi sampler plate and numerous rolls, all of which come in generous portions. The bigger dishes are divided into Water, Fire, Wood and Earth (vegetarian) and are truly spectacular, with the wasabi and soy crusted beef tenderloin taking the prize, and the braised pork belly coming in a close second. It's almost impossible to choose, so you might need to come back for a second or third night. Desserts include mini doughnuts and Tamarind chocolate, which is divine. It's open for dinner from 5:30 p.m. to 9 p.m.